Greetings in the Name of the Lord. I bring you His blessings, my friends. Very few people indeed have no belief in God at all. Almost everyone has at least a feeble belief in a higher intelligence, in a superior wisdom that created this universe. Yet very few people know how to continue on logically from this premise. They limit God all the time. A hundred years ago it would have seemed impossible to you that a machine could fly in the sky, or that you could turn a knob and hear music played hundreds of miles away, or that you could turn a knob and see pictures. Often, because some people whom you trust declare that something is possible and scientific, you agree, even though you yourself never experienced it. Why then, when communication with the spirit world of God is manifested to you, do you still think somewhere in the back of your mind that it is impossible, that it must be, if not a trick, a delusion, the subconscious of the medium, or something of the sort? Is that reasonable, my friends? If so many other astounding things are possible in this world of yours, why should it not be equally possible that God sends you His emissaries of truth for your benefit? This, in itself, is not more astounding than so many other things that you have freely accepted. Furthermore, there are a number of people who know and admit that a communication with the beyond is possible. They have experienced it; they have no possible doubt about it. Yet, they deny the possibility of such a communication with higher entities than themselves. This is even more unreasonable! Although it is quite true that a communication with divine spirits is far more difficult to obtain, which is as it should be, it is highly illogical to believe that it is impossible. If God has created any possibility of communication with people on the other side, then He must also have given you the means of communing with higher spheres from where you can receive teachings that further you spiritually and bring you nearer to God. So, my friends, communication with divine spheres is possible; it has always existed and will always exist. How frequently it occurs depends solely on people, on whether or not they fulfill the necessary requirements. I have occasionally mentioned what these requirements are and may mention them again in the future. However, any of you who are seriously interested can find out about the mechanics of mediumship, of what is necessary to communicate with divine spheres, what the difference is between such advisable communication and that with earthbound and erring spirits and how this difference can be determined. In fact, any one of you who really wants to form a judicious opinion has the duty to find out, otherwise you have no right to say, even to yourself, that all this is impossible. There are many people who are called. God is calling them. Whether this call will come forth or not depends on a person’s spiritual development. Granted, there are many, many people living on earth who have not experienced such a call. They are still in their spiritual childhood and such a call would be meaningless for them. They have not yet attained the strength and development necessary to follow it; therefore God waits until they have reached sufficient maturity in the course of their various incarnations, where they gather experience and wisdom, and, step by step, develop spiritually. But at some time the call must come forth, and I venture to say that everyone of you, my friends, has been called. How do you feel this call, you might ask. As I have said repeatedly, the human being consists of two natures: the higher and the lower self, which are in conflict with one another. The higher self registers the call and pushes the person in a certain direction which the conscious self cannot immediately interpret. The conscious self just feels a certain longing, a certain dissatisfaction with the present life, even when you fulfill all your earthly duties to the best of your ability. Nonetheless, there is a certain voice within you, a certain pressure; it seems as though you were being pushed in some unknown direction, you don’t know quite where and why. You will eventually find out, provided you do not fight against it and do not give in to your lower self. If your lower self were not also alive within you, it would be comparatively easy to follow the call. But your lower self does not want to make any effort, it does not want any change, and it holds you back and furnishes you with many excuses not to follow your higher self. The excuses are manifold. Some are quite transparent, like “I have no time.” Or they take the form of doubts. These are all rationalizations but, being inexperienced in differentiating and in pulling off your masks, you believe the pretexts and self-illusions, the voice of your lower self, because you want to believe these rationalizations; it is so much easier to do so. But until this fight is successfully won, once and for all, you will not have peace—never, my friends! The call will become stronger and stronger as you go on, and the more you resist it, the more dissatisfied you must become with your life. The more God can expect from you because of your basic spiritual development, the more dissatisfied you must be if you do not follow this call. The question has been asked time and again why there are so many people who are inferior to others and yet are much happier. This appears to be an injustice. Why is this so? It is because less can be expected of a child in a lower grade than of a child in a higher grade. You must be dissatisfied with your outer life as well as with your inner life if you do not deliver according to your development. Now that you have understood how the call is felt, I will explain what follows it and what is expected of you. Your lower self has some idea of it. If it had not, it would not fight against it. Now what does God want from you when He calls you? He does not expect you to be a martyr or to fulfill tremendous tasks; though He may expect the latter of some of you, he does not expect it from most of you. You can fulfill His will between your four walls and no one has to know about it. Who is to say what is a big task and what is a little one? Simply because you are famous and in the limelight does not necessarily mean that your task is a greater one than working spiritually in solitude with no one knowing about it. What God wants from each and every one of you, as the first step and necessary prerequisite before you can give to others, is self-development, self-purification, and self-knowledge. It is tearing off your masks; tearing away all your self-delusions about yourself and your inner or outer motives. God expects this from you. Whoever is not quite happy and harmonious can truthfully declare: “I have not quite followed God’s call.” How happy are you? How well-balanced are you? How harmonious are you “inside”? Outside you may have troubles, but if you are truly on the right path and fulfill God’s will for you, no matter what your outer difficulties may be, you must be happy. That should be your yardstick and indication of where you stand and how much you are fulfilling, my friends. I want each one of you, when you go home tonight, to ask yourself: “How happy am I? How satisfied am I with my life and with myself?” Think about it. If you feel any disharmony or dissatisfaction, you will know the answer. If you really want to follow the call, you can. Do not say, “I do not know how or where to turn; I cannot do it alone.” Of course, you cannot do it alone. However, first you must really want to do it; first you must decide for it clearly and unconditionally, then God will guide you wherever you need to go and through whatever means may be best for you so that you receive the necessary help from outside, so that you can develop yourself within to the highest degree that can be expected of you. It is not enough that you lead a decent life and are a so-called ethical person who does no harm to others and who does not violate earthly laws. This may be enough for a person who is a younger soul, but not for any of you, my friends. 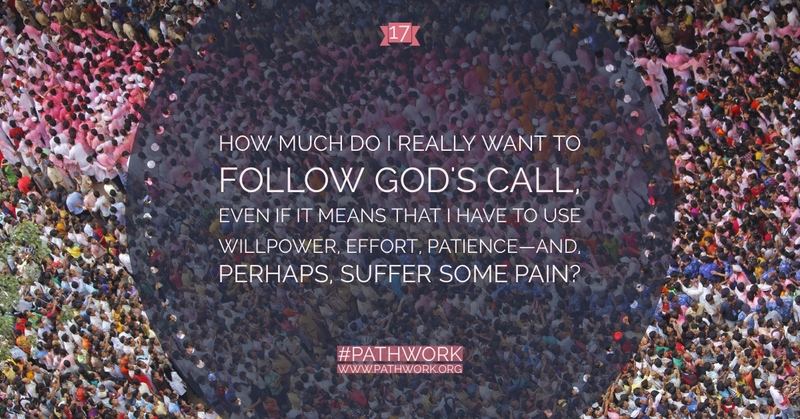 So test yourself and answer the question: How much do I really want to follow the call, even if it means that I have to use willpower, effort, patience—and, perhaps, suffer some pain? Self-recognition and the tearing off of masks is always painful during the process, although it is a great relief afterward—a relief that will bring a very new peace into your soul once you have overcome the initial resistance. So you must realize that first you have to go to battle with your lower self; you have to enlist your conscious willpower to conquer your lower self. Combined with your higher self, your will-directing consciousness must win. But do not be superficial about it. Test yourself again and again as to how sincere, how deep is your desire to do God’s will. How much are you willing to sacrifice? What you have to sacrifice may be comfort, self-delusion, selfishness, holding on to various faults and weaknesses. How much are you willing to give up all this? First this sacrifice will appear to be tremendous, but only while you are in the battle. Afterward will come the realization that you have freed yourself of burdens and chains that were directly responsible for your unhappiness. Afterward you will recognize without a shadow of a doubt that God’s will for you means no sacrifice, for it brings you happiness on every plane of existence: physical, mental, emotional, and spiritual. But as long as you have not actually won this victory, the decision and its consequences will appear to you to demand a sacrifice—and this, too, is what God wants from you. There is a reason why He does not give you the realization of all this before, but only afterward. In other words, until you have completely decided to do the will of God, whatever this may mean, and until you have made your lower self submissive—and this can be done if you penetrate your willpower into all layers of consciousness—you should not even try to think about what you should do or what the practical consequences of your decision will be. What follows next will be made known to you through guidance, through inspiration. Do not worry about it now. First you have to prepare the ground, lay the foundation stone through this initial fight within yourself that enables you to make the great decision. Only then can you cross the first threshold on the path to God. But this fight cannot be won in one day. It is sometimes a hard battle and you should know what you are letting yourself in for as you go into it. However, I can promise you, my friends, that if you have reached the stage when you can say, “I want to follow the call one hundred percent,” you have won the most important and the most difficult of all battles and nothing that follows on this path can be compared to it. You will emerge from this battle not only victoriously, but also a great deal stronger than you were before, and, needless to say, a somewhat happier person. You will not be quite the same person you were before you entered this battle. And then God will help you further along to take the next step. This you may safely believe. Ask God for the strength to win the battle. All you have to do is to think of asking God for His help. Many people say wonderful prayers using beautiful and poetic words, but they seldom think of asking for help with their immediate spiritual problems. This is a great mistake, for there are also spiritual laws governing this issue. If you ask for help, you can receive it, particularly the kind of help I have mentioned. You are expected to turn to God with your difficulties. If you really want this help with all your heart and ask God for it, He will answer you. I can promise it. The only question left is how honestly do you really want it? How much still remains of your lower self that is powerful enough to pull you into the opposite direction? As long as you do not face this and do not want to realize the significance of it you cannot win, and your prayer will not have the desired effect because it is half-hearted and full of reservations. I am giving you these words so that you will know how to win your battle and follow your call. Only then will you find the peace and harmony of the fulfillment for which you are longing—all of you. Everyone knows that selfishness is wrong. By the same token, everyone knows that to give to one’s brothers and sisters is right. It is according to divine law, and it makes one happy. There are many different kinds of giving, however. For many people the easiest way out, if I may say so, is to give financially. It hurts least and it means the smallest sacrifice. Everyone knows, on the other hand, that to give love is the greatest gift of all. And each one of you asks nothing better than to be able to give love. But how many of you find yourselves saying, “If only I knew how! I am unable to love as much as I want to love.” If this is how you feel, my dear ones, your soul is sick in some way and it must be cured. You cannot effect this cure alone, but God will help you. If all your inner currents were flowing according to divine law, you would certainly be able to love. Each one of your faults and shortcomings is a direct hindrance to the unfolding of love. When I say unfoldment, I mean that the love you wish to give forth is already within you. You cannot receive it from the outside. It exists within you, but it is covered by obstructing layers that prevent your love from shining through, from manifesting itself. These layers are, as I said, your faults, your fears, and your ignorance of spiritual law. These layers have to disappear, and this can only be accomplished by your very personal and serious endeavors. This is the path to God. This is what it means to follow the call. Each one of your faults is a direct or indirect hindrance to love. You can never learn love through forcing yourself, but love will grow and evolve as an organic consequence of your self-purification. One of the best meditations is to ponder: “What are my faults? And how could any of my faults possibly hinder the manifestation of the love that obviously must be hidden within me?” I challenge each one of you to present me with a personal example, for at first you may think that a number of your faults could have absolutely no bearing on the unfoldment of love, and yet it is so! At the same time, there is a wonderful and direct road to loving, in addition to the indirect one just mentioned. Both should be taken simultaneously to further the growth of love within you. If you can bring yourself to learn to do what I will tell you now, you will gain a powerful weapon to cure yourself of the sick currents within your soul, and you will unfold the love in you. Each living individual has the understandable tendency to want to appear superior to others. You hide your faults, you hide your shortcomings, and you want to show your best side. You all crave admiration, acceptance, and love. You think that showing your best side will bring you love. And yet you all know that if you want to receive love, you have to give it first. Impressing other people, whether you do it consciously or unconsciously, is not giving love. On the other hand, you decidedly give love in the deepest sense when you give and show yourself as you really are, without any masks—even if it means a little humiliation. Yes, my friends, in this way you offer the greatest gift. Why? Because your fellow creatures feel just as insecure as you do. If they see you as perfect as you want to appear, their sense of inferiority will grow. They will feel, consciously or unconsciously: “He is so perfect—or she is so perfect—why can’t I be that way?” They will feel even lonelier and more deflated, and they will despise themselves even more. Therefore they will, in their blindness and as their only defense, put an even tighter shell around themselves. This separates them even more from their brothers and sisters. They will do what you are doing by trying so hard to appear independent, hard, and oh, so perfect! Yet if you show yourself as you really are, with all your weaknesses, without any pretense, you make a great and generous gift; your brother or sister will think, “Well, he, or she, is not any better than I am,” and this will give him or her a lift. He or she will relax, will feel less lonely. Then do you know what will happen? You will receive in this way exactly what you have set out to gain: love, admiration. You will receive love because you have first given it up. You know the spiritual law: first you have to give up what you want to gain. You have given up admiration, which means you have given up making an impression, wanting love from others because you appear so wonderful; instead you have made a gift to others by diminishing their loneliness in their supposed imperfection. All people think they are quite alone with their imperfections, even though they may see and criticize the imperfections of others all the time. This is one of the inconsistencies of the blind and undeveloped self. You have given up your vanity. You have given up some of your ego. And this is why you must receive in this way, and in this way alone, what you have never succeeded in receiving the other way, which your lower self has chosen until now in its blindness. If you give up your ego in this way, you bestow the greatest possible gift on another human being, and therefore the law must take effect. It is such a simple way, my dear ones, so simple that none of you would ever think of it. And yet, at first it does not appear easy. It seems difficult to pull yourself down from the high place you consciously or unconsciously have built for yourself. Once you have taken this step in spite of all resistance, you must see divine law working within you and outside of you. The result must come. Wherever there is a problem that you cannot solve, try this. Try it! You do not have to exaggerate; you do not have to go to strangers and pull yourself down. This might even embarrass others. Just take off your masks naturally and unostentatiously. Find out what and who you really are and be that person. Here, too, you will receive help, opportunity, and the inspiration as to when and how to do it, once you have decided to ask God for His help. All of a sudden, if you leave yourself open, you will find yourself in a position—perhaps with some member of your family or with a friend—to discover for the first time in your life that you have so far put on an act, that you have not given yourself as you really are. Once you become conscious of this, you will be able to act as you really are, my friends, and without any pretense. No sickly exaggerations! No extremes! As in everything else, here too you find two extremes. A number of people indulge in self-debasement, pulling themselves down in the eyes of others. They say, I am so bad, I am such a sinner, I am this and I am that. This is as insincere a mask as the other extreme. Such people want to accomplish by these means the very same thing as the other group of people. This is quite a smart maneuver, although it is often unconscious. By accusing yourself, you take the weapon out of the hands of the others. In this situation, they will find it quite impossible to accuse you and will even be inclined to contradict your self-accusations; thus the ego is bolstered. Furthermore, you think that accusing yourself is sufficient and that you do not have to do anything further about overcoming your shortcomings. This attitude exists too and it is just as bad as its opposite. When you think about this question, think of the two extremes. It is important to know your weaknesses, and which extreme you tend to, for only what is truly genuine will have an effect: of that you can be quite sure! This too is a law. QUESTION: May I have some help in finding the psychological problem underlying my physical condition? ANSWER: Yes, my dear friend. I will answer your question in a general way which will also apply partly to yourself. I cannot give you a completely personal answer here; it would not be fair to the others, and it would not be fair to you. However, a general explanation will help you to search in the right direction and will, at the same time, be useful to everyone. Whenever there is a so-called psychosomatic illness, the cause or the root of it has to be found in the unconscious. This is very difficult to do alone; nevertheless, there are certain points which I can give you to help you get a little further on this road. In the first place, I would advise you to find out all your faults, for there are hardly any human beings—unless they have gone through such a purification process with help from someone—who are really aware of all their faults. And they can be found. It is not easy; it means perhaps also a little humiliation, which is good and healthy for you, particularly in the connection I have just mentioned. Ask your dear ones, and those who are closest to you and know you best, “Please tell me, what are my faults? You can tell me frankly; I will not be angry with you; I will consider carefully what you say.” And after they have done so, consider every one of the faults that have been mentioned, even if you are convinced that you are unjustly accused. You will always find some grain of truth in what others have observed about you. This will give you a very important clue which will direct you in coming to the roots of your problems. The fewer faults you find, the more proof you have that you do not know yourself very well. The best way to find out about your unconscious apart from dream analysis—but not everyone knows how to do that—is by doing what I call the Daily Review. With its help you can find out your true reactions to certain events; you begin to pull off masks and stop pretenses. You can find out where your actions go against a spiritual law. The daily review should be conducted in the following manner: Let the whole day pass in front of your eyes and in your memory; think of everything that has happened and has given you, in some way, a disharmonious feeling or reaction. And no matter how wrong the other person may have been, the moment you have been negatively touched by it, there must be something wrong within you. Write down in a few words the occasions, your reactions and associations. If you follow this practice through for some time to come, and not just once or twice, but faithfully, you will see after a while a clear pattern emerging. At first, these disharmonious incidents will appear entirely unconnected and isolated; they will be meaningless for you. Later on you will begin to sense and, in time, clearly understand the pattern. This will help greatly. You should pray for enlightenment and guidance every time you conduct the daily review. Then ideas will flow into you and will eventually furnish you with further clues, though at first they may not make sense to you. Do not discard any of the ideas; do not resist them. Later on, all of them will form a clear picture. As with a puzzle, when you look at the pieces, you cannot see the picture, but if you patiently put them together, you will succeed. Thus you will uncover your hidden anxieties and complexes which are responsible for your disease. Most of it is anxiety or fear. This is true of almost all of them, in one form or another. There might be a fear that you do not permit yourself to acknowledge consciously, that you have pushed down into your unconscious. So now you have to let it out. It takes time and effort before you can deal with it properly in your conscious mind and become aware of the spiritual laws from which you have deviated within your soul. QUESTION: I would like to ask if you could explain the miracle of Therese von Neumann who has the stigmata that bleed every week; she has not eaten for years…. ANSWER: Well, I cannot possibly give you in this short time a technical explanation of how these things work, but there are many, many things possible in this world. What you call “miracles” are simply laws you do not understand, just as many people do not know the laws governing communication with the beyond, that a spirit can manifest through a medium. There are many spiritual laws governing mastery over the physical body, and this person is not the only one who has done it. There are other examples where physical functions are completely controlled. When this happens, certain influences from the spirit world can occur. Such phenomena belong in the same chapter. QUESTION: Does it necessarily mean that such a person is spiritually very highly developed? QUESTION: I would like to ask about the evolution of animals. When the highest animal becomes a human being, for instance. That a nice gentle horse becomes the lowest type of human being, such as a criminal, I can’t imagine. ANSWER: No, you cannot say one horse turns into a human being. That is not correct. There are many parts that form a whole. And it does not necessarily have to be a criminal. No, it is not so. It is rather that a person on the lowest level of human development knows very little, is still very blind, and if he becomes a criminal it is only because his free will directs him to give in to the lower part of his nature. You see, the soul particles incarnated as animals are different aspects of the human inner makeup. Perhaps one horse—though this is but a rough explanation—would represent one aspect, and so on. Because the animal soul is not a whole, it is just a particle of a group soul. Before incarnation, the group souls of the respective animals are collected in the spirit world and for a long time they are put through an extremely complicated process, which would be impossible to explain to you. They are made unconscious and their fluids and subtle bodies are dissolved and put through a process where new subtle bodies can form around the original divine spark, nearer to the state that it once was. Then the first incarnation can begin and there is a clean slate. Whatever this being decides, it can do. Is that somehow clearer? [Yes.] I realize this is extremely complicated for any of you to understand. QUESTION: Animals have the same diseases as human beings, but human beings learn from their disease. What can an animal learn from having a disease? ANSWER: That is not the point. At that stage, before the human incarnation, there is nothing to learn; it is just something to go through. QUESTION: Do the great ideas start in the spirit world or do they start here and are taken back? ANSWER: Oh no. They start in the spirit world, of course. For every specialty, art, or science—and I have mentioned this before—there are special spheres. Different creatures work and create in the respective spheres. When these beings are incarnated, they bring something of their knowledge with them. Only part of it, of course. They cannot remember all of it. They unfold their gift here with the help of their friends in the spirit world who guide them accordingly. But the ideas are created in the spirit world. The entire earth is only the effect, not the origin or cause. So everything must be created in the spirit world. QUESTION: Are the spirits or doctors or masters in the spirit world limited in the extent of their ability to advise us in some material problems? ANSWER: Oh, yes, they are, indeed, limited to an extent. They can do it only according to law, which is very firmly regulated and very wisely. Here again you touch on a question that is impossible for you to understand. You can only have a vague idea of it. For example, the spirits cannot possibly interfere with their guidance in anybody’s affairs if the interference would hamper the person’s free will. You live on this earth with your free will for a very definite purpose. It is not so important whether everything is pleasant and painless. Only you human beings think that this is of utmost importance. When you have a disease, when you feel pain, when you have a problem or some sort of unhappiness, you think this is the end of the world. Your goal is to be always happy and to eliminate all problems the easy way, but that is not the point. The point is how you can overcome them, how you can solve your problems, and how you can meet them from a spiritual point of view. Only in that way can you become strong and independent. If there would be undue interference, you would not be capable of learning what you have to learn. QUESTION: Even if we ask for certain specific help? ANSWER: Certainly, help can be given, and this again is regulated according to law. The fact that you ask for it is already a sign that you have learned something. But here again, you have to be careful about how to ask. I would advise you to ask in this way: “Show me, Father, the real reason for my difficulties, so that I can solve them.” Do not ask that the difficulty is simply taken away. That would be the wrong and immature way of asking. But if you ask the right way, trying to learn from your difficulties, you will be answered. And perhaps you will be answered in a very different way than you thought, my dear! QUESTION: To what extent can we expect to help heal our friends through meditation and prayer? ANSWER: Very few people, indeed, have the strength to heal through prayer. However, your prayers and your thinking of friends, or of anyone for that matter, in meditation, is of tremendous help. You cannot even begin to appreciate how much you can help in that way. As you know, each thought and feeling is a substantial form in the spirit world, and no thought is ever lost, especially not a constructive and good one that comes from love and goodwill. These thoughts add to the cosmic reservoir and flow in the universe, so that the forces of good become that much stronger compared to the forces of evil, for each evil thought is added to that reservoir and furnishes it with strength. If, according to many factors which I cannot discuss here, direct help can be given to a particular friend—perhaps in a different form than you human beings can conceive of at present—then your prayer will have an immediate result. If, on the other hand, this dear one has to go through some difficulties for the sake of his or her eventual and permanent happiness and liberation from bonds, then your prayer will not be lost either. You can be quite sure of that. Its form remains preserved, so to speak, and will have its proper effect at the proper time. So nothing of that sort is ever lost. I cannot recommend strongly enough that the few privileged people who have found God in their souls to some extent devote more time to prayer not only for themselves but for other people also. Offer your prayers for general development, for the unhappy souls who have not yet reached even a glimmer of light. So many thoughts are wasted in unproductive and even harmful brooding. If that same time could be used productively—and there is nothing more productive than prayer—then you would add a great force to the Plan of Salvation that is working in the whole universe. QUESTION: I would like to know if everything is a manifestation of man’s belief? ANSWER: How exactly do you mean that, my dear? QUESTION: I mean everything that we know on earth. Is it the result of what we believe it to be? ANSWER: It is very difficult to answer this with a yes or a no. I will try to put it this way: The earth sphere or the material world has been created for you humans for a definite purpose which I have mentioned many times. The main purpose is development. In the earth sphere, development proceeds infinitely faster. Your earth sphere, with all that is contained therein—landscapes, mountains, seas, houses, any object—exists concretely and does not alter its shape according to people’s attitudes. In other words, you see this room the same way as a person of much higher development or someone of much lower development would. The objects in this room remain the same for any human being with a normal sense of perception, while the spirit world is the outpicturing of the spirit’s ideas, attitudes, thoughts, and mentality. There, everything is the result of thoughts, feelings, and deeds. Therefore, spirits of the same development are always together in one sphere. Other spirits, let us say lower ones, could not even see these landscapes or objects which the spirits see and which are the products of their personalities. But on earth it is not that way, and there is a very good reason for that. Yet, in another way, there is a particle of truth in what you have said, but not as far as the actual objects are concerned. It is much more in the sense of what people do with their lives. A person can guide and determine his or her own life to a very large degree, and in that way you are right. Anyone who has sufficient faith will also automatically follow the divine laws. And anyone who is seriously trying to learn and keep the divine laws will gain the faith that may still be lacking at the beginning of this path. Here, too, nobody can have faith by forcing it; it can only grow organically by self-development. It will grow by living these laws, even though it may be difficult at the beginning. Then you guide your own life and produce all the conditions that you need to find God, while by not following the divine laws you produce unfavorable conditions. In that respect what you think is true. Do you understand the difference? ANSWER: Oh yes, that is quite true. These are then the so-called miracles, the so-called supernatural happenings. Any more questions? QUESTION: Could you explain to us in a few words the difference between mysticism and white and black magic? ANSWER: This is too long a subject for tonight. I suggest that you remember the question for next time and ask it at the beginning of the question period, when I will have more time to go into it. I will retire and leave you with the blessings of the Lord. Receive His love, for there is actually a great blessing in this room, right now. And if you are open to it, though perhaps not all of you can see this shining force, you may feel it and receive it and use it for God. Be in peace!